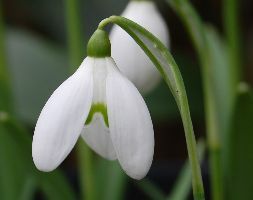 A rare, relatively large and vigorous form, named after Samuel Arnott (born in Dumfries in 1852) who was a keen gardener and snowdrop offocinado. He first discovered this in his garden and later introduced it into cultivation. Like a pumped-up version of the common snowdrop, this super-sized version has deliciously honey-scented flowers. Soil: moderately-fertile, moist but well-drained alkaline to neutral soil. Snowdrops dislike acid soils.